1.) 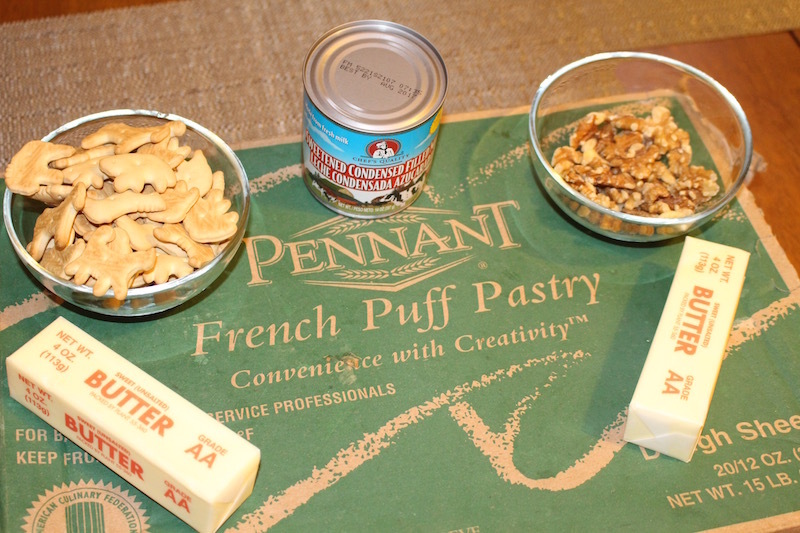 With a rolling pin crush wall nuts and animal crackers into small pieces. 2.) Mix together well so they are separated by each piece. 3.) Pour water into a 5 quarter pot and add one smaller pot inside. 4.) Place butter into the pot and divide into 9 different pieces with a knife. 5.) Turn the heat on high until the water starts boiling and the butter melts. 6.) 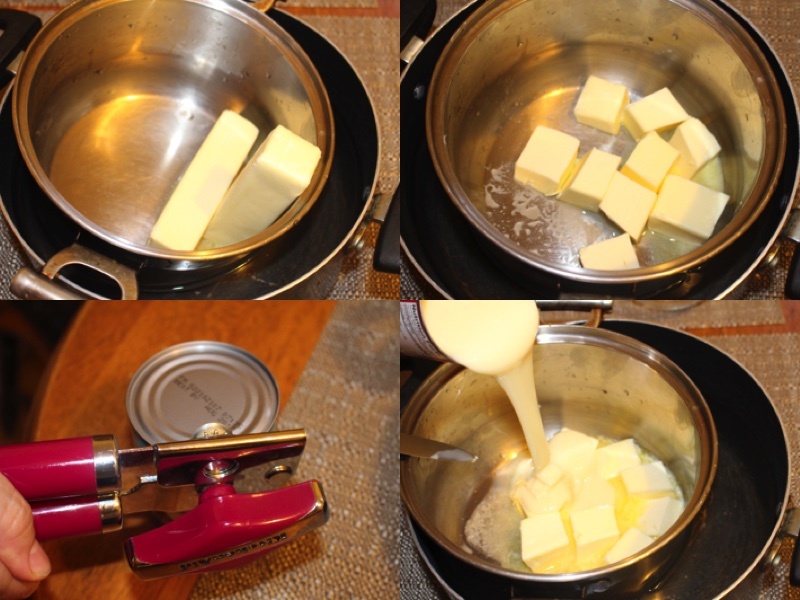 Add a can of condensed milk to the butter pot and mix together well. 7.) 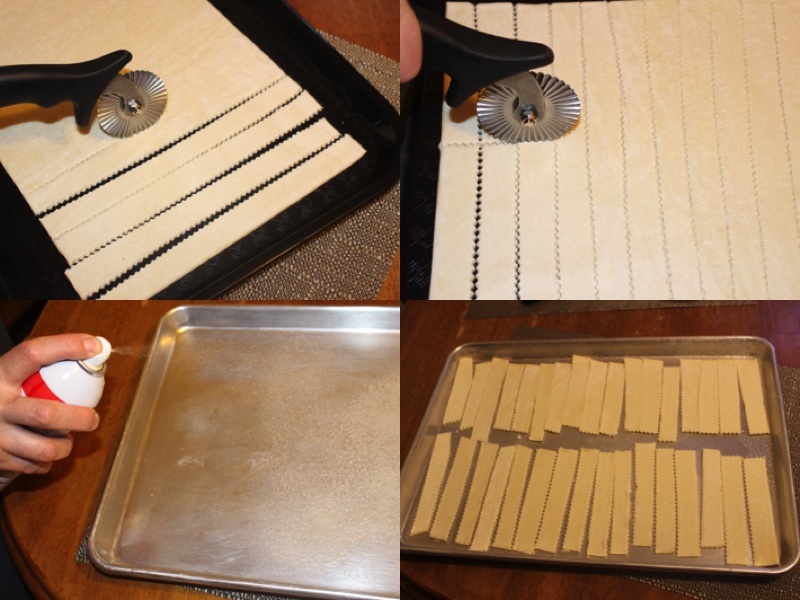 Cut a sheet of puff pastry into 1 inch lines, then divide it across the middle. 8.) Spray a cooking pan with cooking spray and place the puff sticks on top. 9.) Place in oven at 350F for 20 minutes or until lightly browned. 10.) 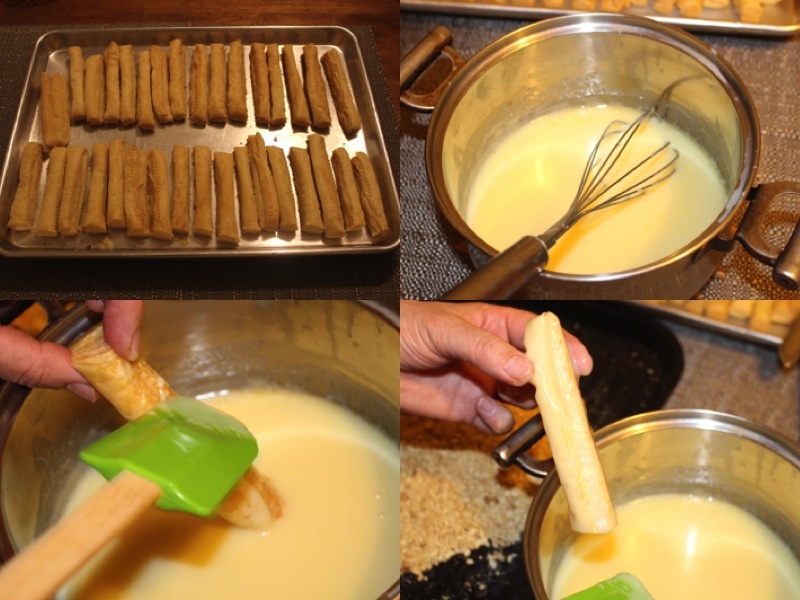 Soak each stick with your butter mixture. 11.) Roll it on you wall nuts and animal crackers until it sticks. 12.) Place in fridge for 30 minutes to cool the butter mixture. Place in serving dish and ENJOY! 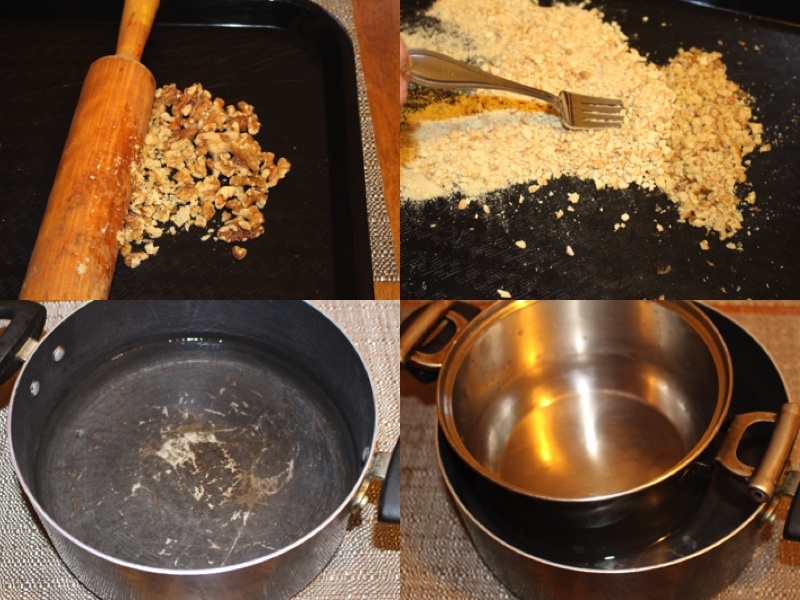 It is a very fast recipe, that is unbelievably easy to make. Will look fabulous on any table, Its dipped in condensed milk with butter, and covered with nuts/ animal crackers. Enjoy! 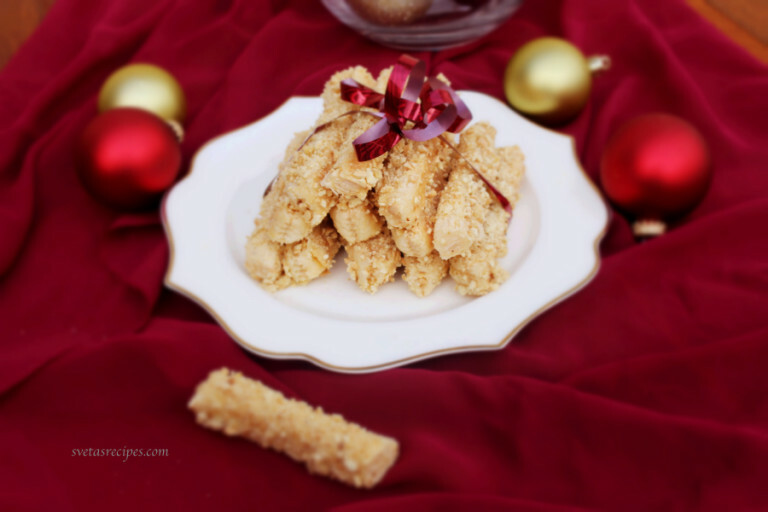 With a rolling pin crush wall nuts and animal crackers into small pieces. Mix together well so they are separated by each piece. Pour water into a 5 quarter pot and add one smaller pot inside. Place butter into the pot and divide into 9 different pieces with a knife. Turn the heat on high until the water starts boiling and the butter melts. Add a can of condensed milk to the butter pot and mix together well. Cut a sheet of puff pastry into 1 inch lines, then divide it across the middle. Spray a cooking pan with cooking spray and place the puff sticks on top. Place in oven at 350F for 20 minutes or until lightly browned. 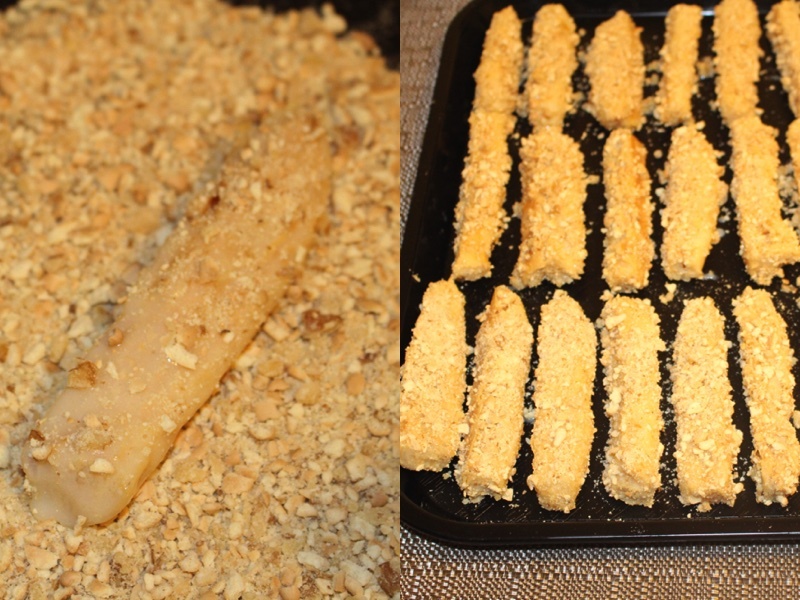 Soak each stick with your butter mixture. Roll it on you wall nuts and animal crackers until it sticks. Place in fridge for 30 minutes to cool the butter mixture. Place in serving dish and ENJOY! These look so nice, what a great idea! It looks like a quick dessert! YUMM! How many days in advance can i make these? And what is the best way to store them? The best way to store them would be in a refrigerator and about 4-5 days at most.